The Power of Habit, a fascinating new book by New York Times investigative journalist Charles Duhigg, takes a look at the nature of habits and their role in our daily lives. Habits are essentially our brains on auto-pilot, hard-wired neurological routes that grow deep and wide from repetition. There are good habits, like saving money and looking both ways before you cross the street, and bad ones, like procrastinating and binge-eating. Often our bad habits feel out of our hands, maybe even genetic, and so we accept them begrudgingly, like we put up with a nagging relative at a family reunion. It turns out we don’t have to. Duhigg argues that habits “aren’t destiny―they can be ignored, changed, or replaced.” Sounds good, but how? It’s simple: figure out the habit loop. 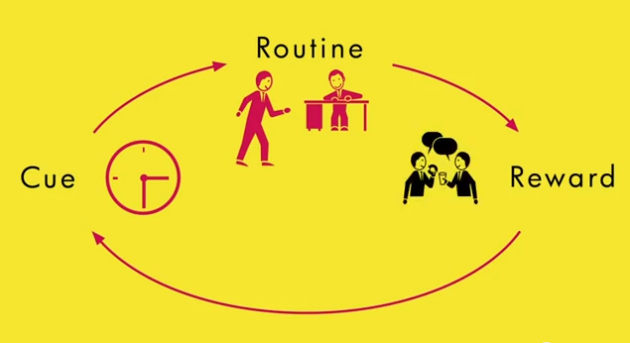 A habit has three major components: a cue, a routine, and a reward. These components form the habit loop. The cue is the trigger that tells your brain to prepare for auto-pilot. The routine can be physical, mental, or emotional; the reward is something that tells your brain whether or not the loop is worth remembering. Chocolate rewards tend to form habits; metal forks in light sockets don’t. If they do, you should make a habit of going to the psychiatrist.